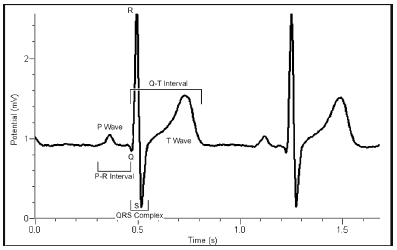 The purpose of this lab was to obtain graphs of electrical activity of the heart over a period of time, to recognize the different wave forms seen in an EKG and associate these wave forms with activity of the heart, to determine an individual’s heart rate by determining the rate of wave forms in the EKG, and to compare a normal wave form to abnormal ones. Prior to starting the lab, my group members and I opened up the LabQuest app and connected the EKG Sensor to it. Then, one of my group members wiped her arms with rubbing alcohol in order for the electrode tabs to stick and to obtain the best results. Three electrode tabs are placed on the inside of her right wrist, right upper forearm, and left upper forearm. Then we connected the EKG clips to the electrode tabs: black on the right wrist, green on the right upper forearm, and red on the left upper forearm. She sat in a relaxed position with her arms resting on the table and we collected the data on the LabQuest app. 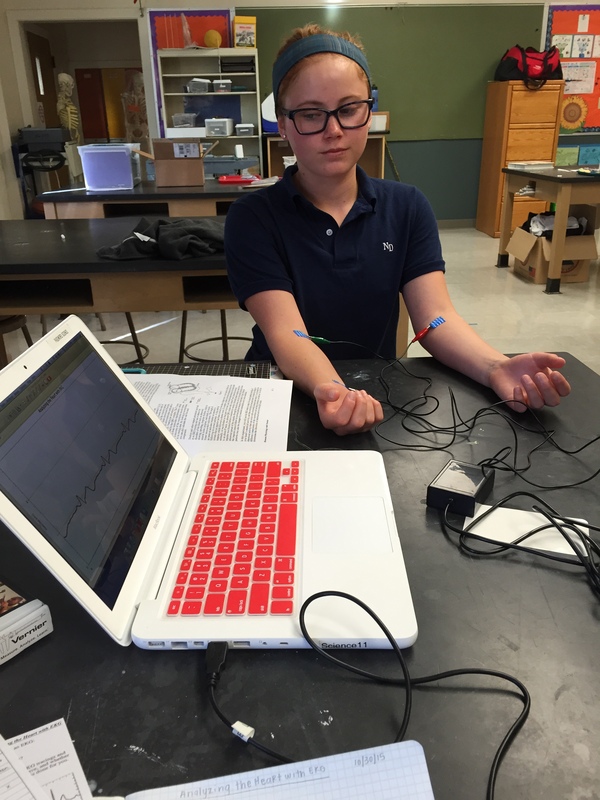 After we collected the data, we switched the red and green EKG clips so that the green clip is now attached to the tab on the left arm and the red clip is attached on the right arm. This will mimic the electrical activity of someone having a heart attack. Then, the data was collected. 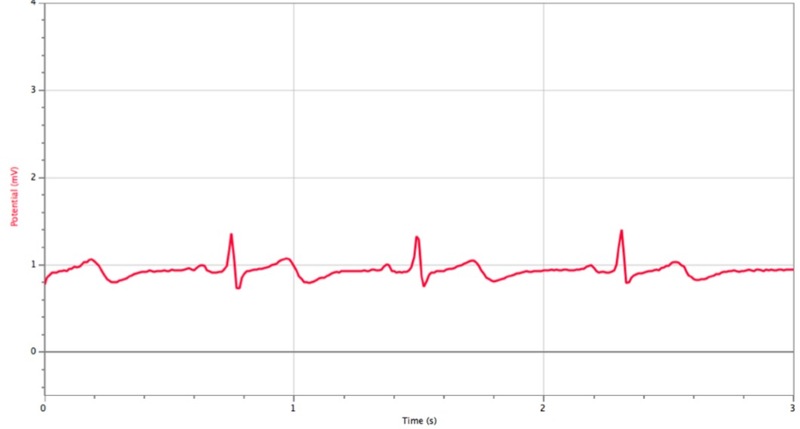 This graph shows a normal heart beat because all the 5 components are present and normal. We were able to collect our data by identifying the 5 components in a heart beat. We also calculated the beats per minute by dividing 60 over 0.82, which equals to 73 BPM. 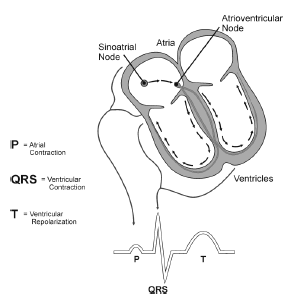 Based on this graph, the P wave is present but abnormal, the QRS complex is inverted and is abnormal, as well as the T wave. The P-R interval of my groupmate’s heart rate is 0.12s and the standard heart rate is about 0.15s. 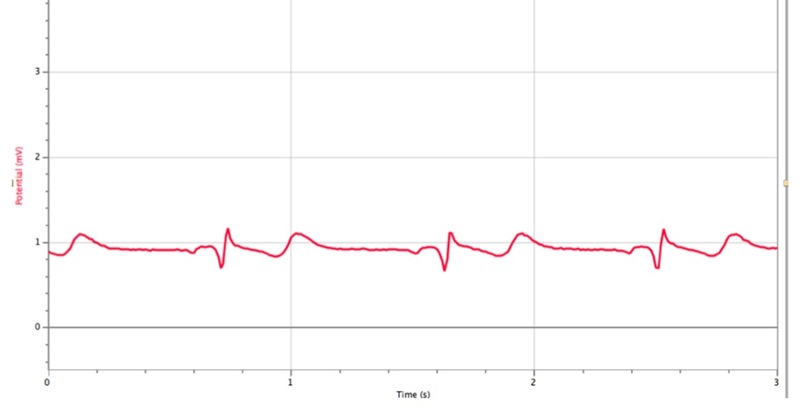 The QRS is 0.05s compared to less than 0.1s on the standard heart rate graph. The Q-T interval is 0.32s and the standard time is about 0.35s. As you can see, her heart rate is normal and healthy.